Play the Best Soccer of Your Life. This Season. Complete step-by-step fitness guide to transform your soccer-specific strength, speed and endurance. Based on proven sports science and the same training methods used by professional players. Perfect for ambitious adult players and coaches of adult teams. We’ve all know that player – the one that lacks any real skill and technique but whose speed and power makes them very effective. They’re frustrating to play against. They’re even more frustrating as a team mate, especially when you’re warming the bench and they’re picking up Most Valuable Player awards. How effective you are on the field. It doesn’t matter how much skill and natural ability you have. If you can’t apply it consistently in a game situation, then you won’t get picked in the starting eleven. And you certainly won’t fulfil any ambitions you have of playing at a higher level. Compare that to the ungainly player who trips themselves up just trying the simplest of tricks, but who has the blistering speed and basic ball control to frighten any defence. Soccer, at EVERY level of the game, is littered with players who lack poise and talent… but they more than make up for their technical shortfalls with raw athleticism. Skill can only be applied within the boundaries of physical fitness. Turn yourself into a soccer-specific athlete. Blend proven sports-science with a desire to succeed and watch it transform your game – far more than any amount of technical practice. When you’re fit for soccer it gives you a level of confidence that makes the game feel easy. You don’t need world-beating trickery to play at a high level. You need to be able to perform basic skills perfectly in the presence of extreme physical demands. That’s why fitness is more important than skill. Fit For Soccer might not turn you into a professional player, but with your committment it will allow you to play the very best soccer you’re capable of. Never succumb to the debilitating effects of lactic acid again. Use the training methods and workouts in this section to stay strong for 90 minutes when every player around you is fading fast. The one type of endurance drill, performed twice a week, that will transform you as a player. How to recover quickly after several, successive high-intensity sprints. Precise endurance training sessions and drills and how they alter over a season. Muscular strength forms the foundation of all athletic movement. Use the strength programs in this program to increase your kicking power, speed, jump height and resistance to challenges. The 4 phases of a soccer strength program and how you can use them even if you only train 2 days a week. How to develop the ideal mix of soccer-specific strength endurance and explosive power. Detailed strength programs and workouts with exact sets, reps and loads. Speed and quickness separates the outstanding players from the average. But being quick involves much more than just the ability to run fast. Learn how to become a fast player regardless of your genetic make up. How to combine strength, plyometric and flexibility training to become as fast as you possibly can. The best drills to develop lightning speed off the mark and blazing acceleration over 10-15 yards. Complete speed, agility and quickness sessions and when you should perform them. Don’t underestimate the value of flexibility training! Not only can reduce your risk of long-term chronic injury, it will increase your speed, agility and explosive power. The different types of stretching and which is best to increase your range of movement. Which form of stretching you should avoid before a game or training session. A soccer-specific stretching program to increase your flexibility and improve body awareness. Build a complete physical profile of yourself in less than one afternoon and compare it to professional players. This is the key to creating an ultra-specific program that will maximize your results in the shortest possible time. A battery of soccer-specific fitness tests that require little or no equipment. Norms and ranges for each test so you can easily highlight your weakest areas and focus on those. Stats for professional players so you can compare yourself to elite performers. Whether you want to work on all aspects of your fitness or just one, whether you have 2 days a week to train or 5, see how to put together the best overall soccer fitness program for your needs. How to combine endurance, strength, power, speed and flexibility training into a realistic program that fits your schedule. Detailed pre-season, in-season and closed season fitness programs that take competitive games into account. A step-by-step guide to creating your own custom made, soccer conditioning program even if you’re starting part way through the season. Most soccer conditioning books forget about goalkeepers, even when they are the first name on the team sheet. 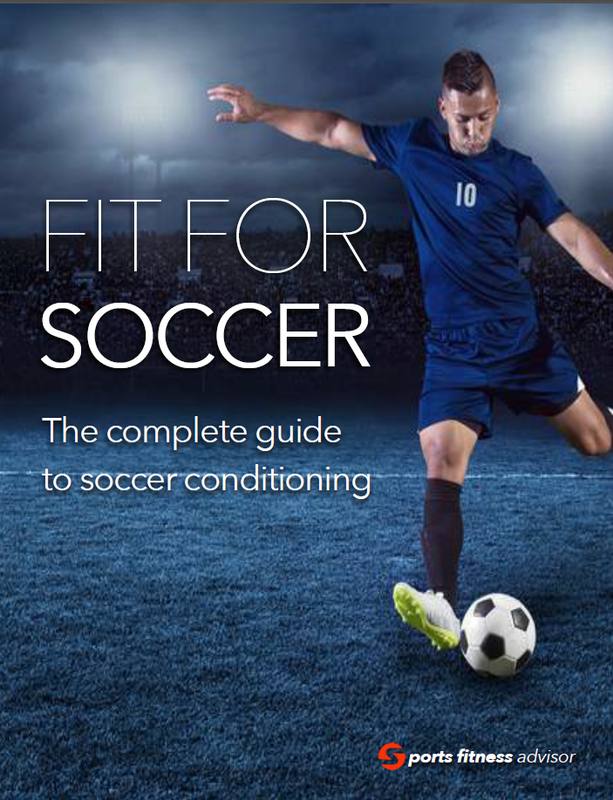 Fit For Soccer contains and entire section dedicated to the number 1 position. It covers endurance, strength, speed & agility and flexibility conditioning, with the same detailed drills, sets, reps and rest periods as the rest of the ebook. There’s also a suggested battery of fitness tests the keepers can measure their current performance against. The Soccer Exercise Library contains over 150 drills, and exercise suitable for soccer players. It’s designed to work hand-in-hand with Fit For Soccer so that you always have a drill or program that will work around the equipment you have available. With drills labelled as ‘team’ or ‘individual’ and ‘with the ball and ‘without the ball’, it’s a perfect reference guide for coaches looking for new ideas for their training sessions. Based on scientific sports nutrition principles, this guide will tell you how to fuel your body for success. You’ll learn what to eat and when before a game or intense training session. You’ll also find out how to refuel your body as quickly as possible after a game. Fit For Soccer Nutrition also cover hydration, the myth of sports drinks and which supplements you should and shouldn’t be taking. Everyone who’s played competitively knows the power of the mind on performance. With abundant self-confidence nearly anything is possible. Without it, you might as well hand up your boots. Fit For Soccer Mental Game gives you 10 very effective principles for getting into ‘the zone’ at will. Based on techniques from NLP and sports psychology, it will give you the competitive edge you’re looking for. Hello, I’m Jacky. I wrote the first version of Fit For Soccer nearly 10 years ago. In that time, it’s helped thousands of players and coaches around the world improve their performance by giving soccer-specific fitness the highest priority. If you’d like to know a bit more about me, you can do that here. Make this your best ever season. Get a copy of Fit For Soccer today and if it’s not for you, simply ask me for a refund within 30 days.